I like to find my limits through endurance. Cycling is a good example, when I went on a holiday a few years ago, although my friends were much fitter than me, I clocked the highest tally of kilometers because I just kept going. Also a few years back, I trekked up to 5000 meters while in Sikkim, India. It was very difficult because I react badly to altitude. There's something I value in being able to keep going even when things are hard. I believe I'm quite patient, or at least it's somewhat of a strength to me. At the moment I'm trying to find a way to use it to make work that's unique to me. I've recently been doing a bit of work that involves a high quantity of lettering, as well as larger typeface projects. I don't think I have a recognizable style yet though, but hopefully it will arrive in it's own time, I doubt I would work trying to force it. I just enjoy experimenting and covering a broad spectrum of styles at the moment. For the past 7 or so months, I've been working all day, every day. I think it has been more work than I've ever done before. It's a good problem to have but it takes a toll eventually. Why do I work that hard? Well, I don't know... I think it runs in the family, my dad, my brother, my grandfather, we all work very hard. When I'm not working on something I tend to feel a bit odd, it's just what I do and I have to do it. I feel like it's the right time in my life to be working that hard. I want to learn what I'm capable of, how to do multiple things at a time, and find where I belong. I don't have anyone that relies on me and I have the time, so now I can. But I know that a rate of work like this is unsustainable, that's what travelling is for though. 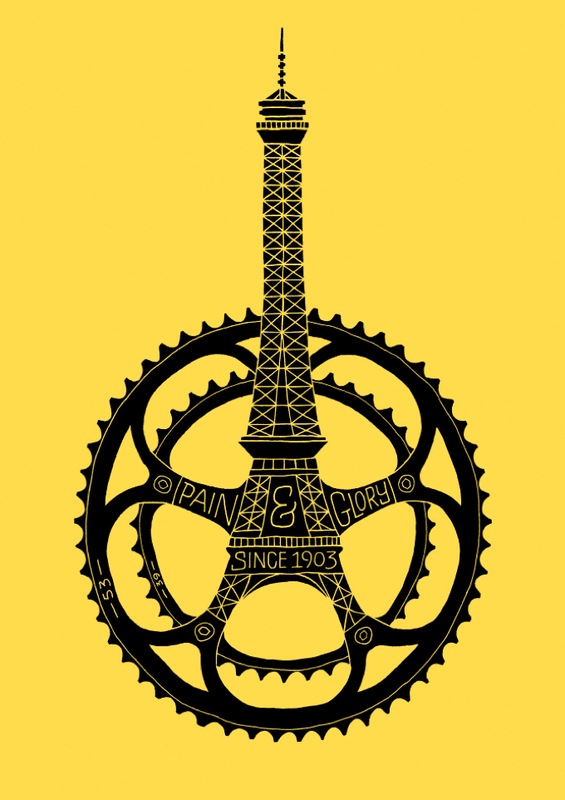 Original print designed in commemoration of the 100th edition of Le Tour de France, by cycling enthusiast Dave Foster. PS: We think Dave deserves it. Don't you?